I don't usually post these, but this one was too good to pass up! You see with this contest, you could win a trip to Walt Disney World! So, yay! Every Disney Princess has had their best moment ever. Merida changed her fate. Tiana opened her dream restaurant. Rapunzel finally saw the lights. 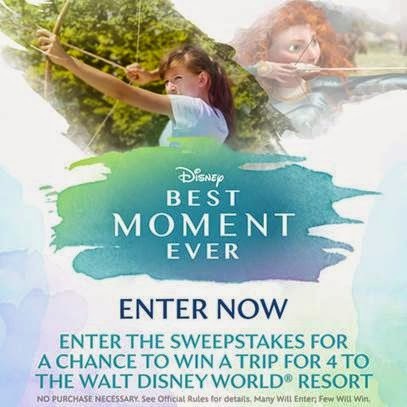 Share YOUR best moment ever and enter for a chance to win a Disney Parks vacation and participate in the Disney Royal Family 5K in The Best Moment Ever sweepstakes, running through May 14, 2014. To enter, submit a photo that portrays a moment of achievement in any activity whether it be recreational, educational or a significant moment in time. With your photo, submit a caption that best describes your moment (less than 140 characters). Check out examples in the Best Moment Ever Photo Gallery and for more detailed instructions, visit Disney.com/BestMomentEver and read the official rules. Visit Disney.com/BestMomentEver to enter now. What an awesome sweepstakes! Enter today!